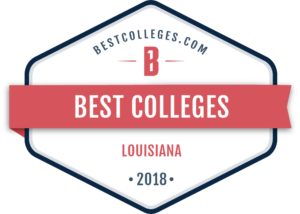 Louisiana Tech University was rated the best university in the state of Louisiana by BestColleges.com in its 2018 Best Colleges rankings. In its rankings, BestColleges.com analyzes admissions and retention data, alongside costs and student loan rates. The focus on academic quality and affordability features an analysis that is valuable for prospective students and their families who are often focused on a university’s return on tuition investment. In addition, the site named Louisiana Tech as the Best Online University in Louisiana for 2018. In its online college rankings, BestColleges.com cited Louisiana Tech’s wealth of online offerings, including the bachelor’s degree in health informatics and information management and online master’s degree programs. For its rankings, BestColleges.com compares colleges on academic quality, affordability, and in-online excellence. The rankings use data from the Integrated Postsecondary Education Data System (IPEDS) and College Navigator, both of which are hosted by the National Center for Education Statistics.